Discussion in 'BBS Hangout' started by mlwoo, Jun 2, 2008. I hope they got all of the origination out of them. Don't know anything about this Ray Stevenson. I really hope it's much darker than the first one and take any kind of happy humor out of it. I also hated how he bonded with Rebecca Romijn and those guys in the first one. I want it to be dark, twisted, and have a high, brutal body count. Here's for the best. He's the guy who played Titus Pullo in Rome, don't know how good he will sound with an american accent, but as Titus, he was a badass. The Punisher kills the lights at some Mob meeting or something in a mansion. While wearing a glow in the dark punisher skull emblem he sticks a road flare in a bowl of something and then he crawls over a table of food and individually kills various mob guys sitting at the table. Can you just picture how silly that is? The review says that the director wrote that script, but I remember checking IMDB and not seeing her name credited as a writer. Sounds weird, but until you see it, don't judge. Nothing can be as bad as the first crap fest. Dolph Lundgren, now he's the original Punisher. Anyone actually see this movie back in the 80's? I sure did, although he was a better He-Man than Punisher. yeah, i use to have it on tape way back when. It really wasnt too bad, from what I remember...then again i was pretty young so who knows. It certainly wasnt any worse than the newer one. Holy crap that flick sucked hard. Dolph was pretty good, the movie wasn't. 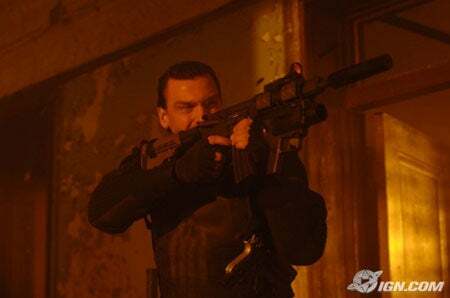 Dolph was great as the Punisher! But like what was already said, the movie wasn't very good. The new Punisher for War Zone. The movie as whole actually was actually somewhat forgettable, but Dolph was like the brightest spot of the film, along with some of the action scenes. It was nice little 80s action movie, but real action movie at that. With absolute carnage and real fx. I would like to see a movie more in that vain nowadays. Besides today, outside of few martial arts stars, we don't really have any action heroes unless you count Will Smith or Matt Damon, but compared that to the likes of Arnuld, Chuck Norris, Jean Claude Van Damme, Bruce Willis, Kurt Russell, Charles Bronson, and see what I mean. I liked the most recent Punisher. I thought it was better than all the B-list comic book hero movies it was supposed to be aligned with (Spawn, Daredevil, Ghost Rider) and even better than several pretty-bad-if-you-think-about A-list sequels (the recent Superman, Spiderman 3, X-men 3). The entire movie had this dark fatalistic humor to it, but it wasn't all about the blood and guts. It was stuff like that over-the-top assassin who looked like Wayne Newton and wrote him a song before trying to kill him. It was the Russian beast of a man who got stabbed in the chest, laughed, then turned the knife around in a arm-wrestling sort of deal and stabbed the Punisher guy in the exact same spot of his chest. It was the ending where he made the guy hold a grenade he had no chance of keeping up while he walked out the building because he knew the other guy would try to survive as long as possible. And it was the complete lack of CGI effects, hearkening back to the Die Hard/Lethal Weapon/Schwarzenegger days of carnage. It was Old School and that's what made it great. Good to finally find someonelse who really liked that one!!! I wish he would have stayed and played him again but hope the sequel will be good. I'm not impressed by this trailer. Am I the only one who loved the first one? Trailer looks promising. Is Marvel Studios handling this? I didn't think it is as bad as everyone is making it out to be. ya they're handling all of their movies now. anywho, I thought the most recent movie was pretty good. I liked thomas jane as punisher also, wish he could have stuck around. I remember the old school dolph flick too, and I don't remember it being that bad either. especially compared to that garbage captain america movie that was out around the same time. anywho, after watching the new trailer I wasn't impressed. I'll reserve judgement though...cus I didn't like the original iron man trailer (the subsequent ones were pretty good and the movie itself was sick), I didn't like the original hulk trailer (and I have loved all of the most recent ones, I have high hopes for the movie as well), so I have no reason to believe this one will be any different. This is still Lions Gate. Marvel Studios doesn't have the rights to all their characters. Spiderman is still at Sony, X-Men are still at Fox, etc. Thanks for posting the tailer. Just like seeing the Transporter 3 trailer the other day, this movie looks like good fun action to me. Nothing wrong with that! Horrible news. Wolverine not being a Marvel in house project breaks my heart. The director's blog is anybody is curious, she talks about the trailer and a bit about the film. "I’ve been told that you can’t even show heads blowing up in red-band trailers."